There were another seven "success stories" told on Wednesday during the 2016 Conservation Day at the Oklahoma State Capitol. The Oklahoma Conservation Commission, along with the Natural Resource Conservation Service and the Oklahoma Association of Conservation Districts reported that the Commission plans to take data to EPA this summer to delist seven streams in the state that they say have been cleaned up from a variety of water quality problems. 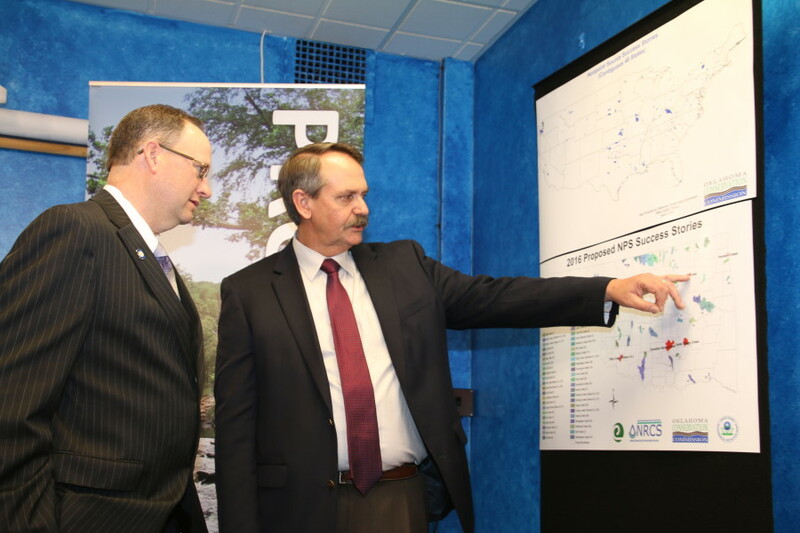 Several lawmakers were in attendance at the News Conference held at the Capitol- including State Senator Eddie Fields, seen here with Conservation Commission Executive Director Trey Lam, as they look at the map of Success Stories in water quality improvement for the state. If EPA concurs with the findings of the OCC, that will mean that since 2007, voluntary conservation by farmers and ranchers has resulted in 55 Oklahoma streams being removed from EPA’s list of impaired waterbodies. The 55 streams Oklahoma has improved so far drain 3.9 million acres. That’s 1.5 million acres more than any other state. Shannon Phillips leads the water quality improvement efforts for the Conservation Commission- and she told Radio Oklahoma Network Farm Director Ron Hays that she is confident that EPA will approve Oklahoma's request. She says the work has been done to clean these streams up and the Commission has been able to prove that because of the water quality monitoring program that the Conservation Commission has developed. "We wouldn't be able to have that adequate data without the water quality monitoring program- that's one of the things through the state's budget cuts that we have tried to protect as best as we can." She adds that "the majority of these streams are streams where the NRCS and local Conservation Districts have used farm bill funding and locally led conservation programs to solve water quality problems." You can hear her conversation with Ron and Sam Knipp of AFR by clicking on the LISTEN BAR below. A map of the Oklahoma Success Stories can be seen by clicking on the PDF link at the bottom of this story.